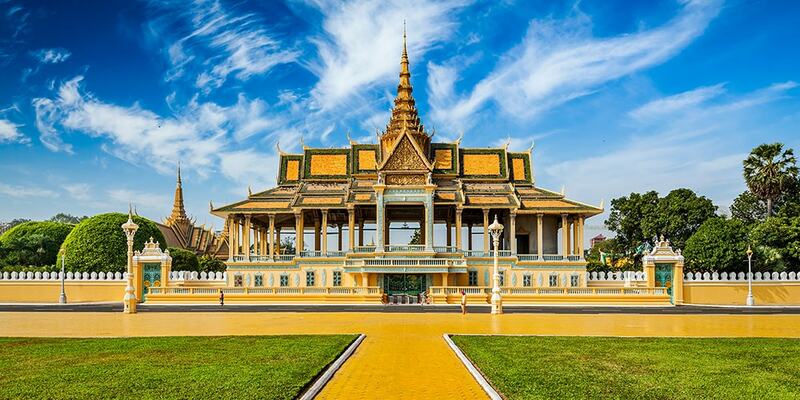 Phnom Penh, a relatively small city, is easy to navigate as it is laid out in a numbered grid. The most important cultural sights can be visited on foot and are located near the riverfront in the most attractive part of the city. Most other sights are also fairly central, just a short remork-moto (tuk tuk) ride from the riverfront. Every morning at the crack of dawn, and again at dusk, Cambodians gather in several pockets throughout the city to participate in quirky and colourful aerobics sessions. This quintessential Cambodian phenomenon sees a ringleader, equipped with boom box and microphone, whip protégés into shape with a mix of 1980s, Soviet-style calisthenics and Thriller-inspired line-dancing moves. It’s favoured by middle-aged Khmer women, but you’ll see both sexes and all ages participating, and tourists are more than welcome. There are many places to join in the fun or just observe. Olympic Stadium is probably the best spot for the sheer volume of participants; several instructors compete for clients and the upper level of the grandstand becomes a cacophony of competing boom boxes. The riverfront usually sees some action: the space opposite Blue Pumpkin at the terminus of St 144 is a good bet. Another popular place that usually sees several groups in action is Wat Botum Park, along Samdech Sothearos Blvd. Boat trips on the Tonlé Sap and Mekong Rivers are very popular with visitors. Sunset cruises are ideal, the burning sun sinking slowly behind the glistening spires of the Royal Palace. A slew of cruising boats are available for hire on the riverfront about 500m north of the tourist-boat dock. Just rock up and arrange one on the spot for around US$20 an hour, depending on negotiations and numbers. You can bring your own drinks or buy beer and soft drinks on the boat. Public river cruises are another option. They leave every 30 minutes from 5pm to 7.30pm from the tourist-boat dock and last about 45 minutes (US$5 per head). It is easy enough to hire a bike and go it alone, although take some time to familiarise yourself with traffic conditions first. Koh Dach is a doable DIY trip, or venture across the Mekong River on a local ferry (1000r including bike), which departs from the riverfront just north of the eastern end of Sihanouk Blvd, and pick up bucolic back roads on the other side. Or opt for something more organised (with or without a guide). Vicious Cycle runs daily group tours to Udong or Koh Dach, departing before 8am. The fanciest hotels in Phnom Penh will let you use their gyms and pools for a fee. A few of the boutique hotels will let you swim if you buy a few bucks’ worth of food or cocktails. Keep in mind that the pools at most boutique hotels are pretty small, more for dipping and cooling off than for doing laps. Most other midrange boutiques charge US$5 for pool rights. If you can’t survive without a swing, Phnom Penh has several 18-hole courses, but most of them lie about 30km or more out of town. There are plenty of massage parlours in Phnom Penh, though some are purveying ‘naughty’ massages. However, there are also scores of legitimate massage centres and some superb spas for that pampering palace experience. Yoga studios around town hold regular classes. Check their websites for schedules. Some offer discounts for multiple classes. 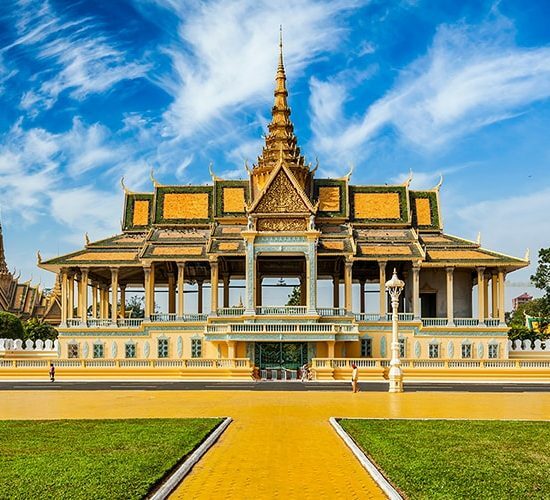 Accommodation in Phnom Penh, as in the rest of the country, is great value no matter your budget, with quite literally hundreds of guesthouses and hotels to choose from. There are some great boutique hotels around the city if you want to treat yourself after an upcountry adventure. While the idea of resting up on the riverfront has obvious appeal, you’ll find better value elsewhere. Also keep in mind that hotels along the river tend to be noisy, and most budget rooms are windowless or face away from the river. A few superb options exist at the top end, but worthwhile pickings are much slimmer in the budget and midrange categories. If you want to be near the riverfront but not pay riverfront prices, this area is a happy hunting ground. Be aware, though, that the blocks running west off the river from St 104 to about St 144 are gritty and have sleazy areas; a handful of delectable new boutique hotels point to the slow gentrification of this prime real estate. Meanwhile, St 172 between St 19 and St 13 has become Phnom Penh’s most popular backpacker area. Boeng Kak Lake was once backpacker central, a lakeside version of Bangkok’s Khao San Rd, until the lake was completely filled in with sand in 2011 as part of a massive development project. The area has an abandoned feel these days, as most guesthouses moved south to St 172 or St 258. Some residents are still holding out for compensation from the government, and there are still a handful of guesthouses here, but the main reason to venture north is the street art scene, with lots of Banksy-style art on the remaining walls. The hotels in this zone are ideally positioned: they’re located on or within walking distance of the river and are close to the Royal Palace. Cosy boutique hotels set around a pool are in abundance here. Walk-in backpackers can target St 258, which has a clutch of cheap guesthouses. With the downfall of the Boeng Kak area, the zone south of Psar O Russei has emerged as a popular alternative for budget travellers. It’s a mix of high-rise hotels and backpacker-oriented guesthouses. Popular among NGO workers and expats, the Boeng Keng Kang (BKK) and Tonlé Bassac districts, south of Independence Monument, comprise the flashpacker zone, with an expanding selection of fine midrange hotels to go with a wealth of trendy bars and restaurants (plus a few good hostels). Many of the hotels are centred on St 278, dubbed ‘Golden St’ because of the preponderance of hotels that feature ‘Golden’ in their name. For foodies, Phnom Penh is the real deal, boasting a superb selection of restaurants that showcase the best in Khmer cooking, as well as the greatest hits from world cuisines such as Chinese, Vietnamese, Thai, Indian, French, Italian, Spanish, Mexican and more. Visitors to Phnom Penh are spoilt for choice these days. There is nothing better than an iced coffee or fresh fruit shake after surviving the scrum that is the Russian Market. In the market’s central food-stall area, look out for the charismatic Mr Bounnareth, whose patented ‘best iced coffee in Phnom Penh’ has been living up to its name for more than three decades. Other stalls sell fried noodles and banh chev (meat or seafood and veggies wrapped inside a thin egg pancake and lettuce leaf) for US$1 to US$2. The streets emanating east and south from the Russian Market are home to several stand-out restaurants and bars. Phnom Penh has some great bars and clubs, so it’s definitely worth one big night out here. There are lots of late-night spots clustered around the intersection of Sts 51 and 172, appropriately nicknamed ‘Area 51’. ‘Golden St’ (St 278) is also popular, and the riverfront has its share of bars as well. St 308 and Bassac Lane have emerged as the hipster area of town. Happy hours are a big thing in Phnom Penh, so it pays to get started early, when even such storied watering holes as the Foreign Correspondents’ Club and the Raffles offer two-for-one specials. Wednesday is ‘Ladies’ Night’ at some of the smarter bars around town, with two-for-one deals all night or even free drinks. Most bars are open until at least midnight, which is about the time that Phnom Penh’s clubs swing into action. There are now some good microbreweries around town turning out homegrown craft beer and these are well worth seeking out. Bassac Lane is the moniker given to an alley that leads south off St 308. The brainchild of Kiwi brothers the Norbert-Munns, who have a flair for drinks and design, there are half a dozen or more hole-in-the-wall boozers in this eclectic spot. Choose from fusion wraps and burgers at the original Meat & Drink, tiny and intimate Seibur, the refined Library, newcomer Harry’s Bar or custom-bike tribute bar, Hangar 44. There’s even a gin palace, the tiny Cicada Bar. From out of nowhere, Bassac Lane has become the new Bohemian district of Phnom Penh and is well worth a visit. There are some great hostel bars in Phnom Penh, so keep these in mind if you want to meet other travellers on a big night out. Top Banana is one of the liveliest rooftop bars. Check out Blue Dog’s streetside bar or the rooftop bar at Mad Monkey, in the same part of town. Eighty8 Backpackers has a ‘first Friday of the month’ party that sees the expat and backpacker worlds collide. Sundance Inn has two lively bars at its two locations on St 172 and the riverside (79 Sisowath Quay). Phnom Penh boasts a surprisingly active music scene, with several talented expat and mixed Khmer-expat bands. Check out Leng Pleng (www.lengpleng.com) for weekly live-music listings in Phnom Penh. For the low-down on club nights, check out Phnom Penh Underground (www.phnom-penh-underground.com), an online guide to the club scene in Cambodia’s capital. For news on what’s happening in town, AsiaLife is a free monthly with entertainment features and regular listings. The Friday edition of the Phnom Penh Post includes the ‘7 Days’ supplement with listings information. The whole world knows about muay Thai (Thai boxing) and the sport of kickboxing, but what is not so well known is that this contact sport probably originated in Cambodia. Pradal serey (literally ‘free fighting’) is Cambodia’s very own version of kickboxing; you can see some fights in Phnom Penh. Popular Cambodian TV channel CTN hosts live bouts at 2pm on Friday, Saturday and Sunday out at its main studio on National Hwy 5, about 4km north of the Japanese Bridge. Entry is free and there is usually a rowdy local crowd surreptitiously betting on the fights. Most bouts are ended by a violent elbow move and there’s a lot more ducking and diving than with other kickboxing genres. An even older martial art is bokator, or labokatao, which some say dates back to the time of Angkor. It translates as ‘pounding a lion’ and was originally conceived for battlefield confrontations. Weapons include bamboo staffs and short sticks, as well as the krama (checked scarf) in certain situations. The Pras Khan Chey Bokator School in Phnom Penh offers lessons (US$5 per hour) or full brown-belt courses (US$1500). Call ahead to ensure you get an English-speaking instructor. There is some great shopping to be had in Phnom Penh, but don’t forget to bargain in the markets or you’ll have your ‘head shaved’ – local slang for being ripped off. As well as the markets, there are now some shopping malls in Phnom Penh. While they are not quite as glamorous as the likes of the Siam Paragon in Bangkok, they are good places to browse (especially thanks to the air-conditioning) and offer some reliable food courts and restaurants, as well as retail therapy. While the markets are best-known for international clothing from the local garment factories, a multiplying number of stores surrounding the Russian Market sell authentic brand-name gear, made locally and in neighbouring Vietnam. There are also several boutiques around town specialising in silk furnishings and stylish original clothing, as well as glam accessories. Many are conveniently located on St 240, Cambodia’s answer to London’s King’s Rd. Plenty of shops sell locally produced paintings along St 178, opposite the Royal University of Fine Arts between Sts 13 and 19. With a new generation of artists coming up, the selection is much stronger than it once was. Lots of reproduction busts of famous Angkorian sculptures are available along this stretch, great for the mantelpiece back home. Make sure to bargain. The Cambodian people are very gracious hosts, but there are some important spiritual and social conventions to observe. Buddhism When visiting temples, cover up to the knees and elbows, and remove your shoes and any head covering when entering temple buildings. Sit with your feet tucked behind you to avoid pointing them at Buddha images. It’s also good to leave a small donation. Women should never touch a monk or his belongings. Meet & Greet Called the sompiah, the local greeting in Cambodia involves putting your hands together in a prayer-like manner. Use this when introduced to new Khmer friends. When beckoning someone over, always wave towards yourself with the palm down. Modesty Avoid wearing swimsuits or scanty clothing around towns in Cambodia, even in beach destinations. Wear a sarong to cover up. Saving face Never get into an argument with a Khmer person. It’s better to smile through any conflict. In the 1430s, Angkor was abandoned and Phnom Penh chosen as the site of the new Cambodian capital. Angkor was poorly situated for trade and subject to attacks from the Siamese (Thai) kingdom of Ayuthaya. Phnom Penh commanded a more central position in the Khmer territories and was perfectly located for riverine trade with Laos and China via the Mekong Delta. By the mid-16th century, trade had turned Phnom Penh into a regional power. Indonesian and Chinese traders were drawn to the city in large numbers. A century later, however, the landlocked and increasingly isolated kingdom had become little more than a buffer between the ascendant Thais and Vietnamese, until the French took over in 1863. 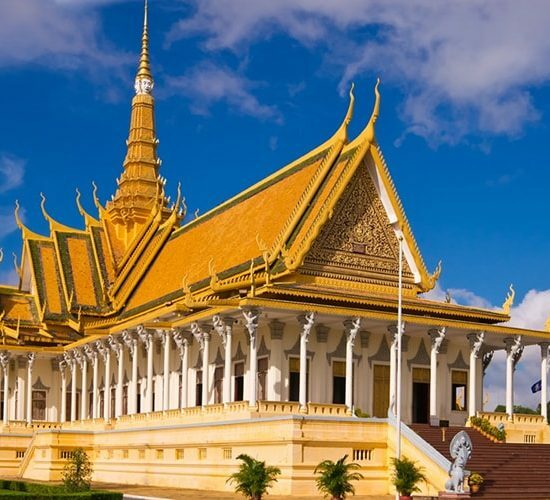 The French protectorate in Cambodia gave Phnom Penh the layout we know today. They divided the city into districts or quartiers – the French and European traders inhabited the area north of Wat Phnom between Monivong Blvd and Tonlé Sap. 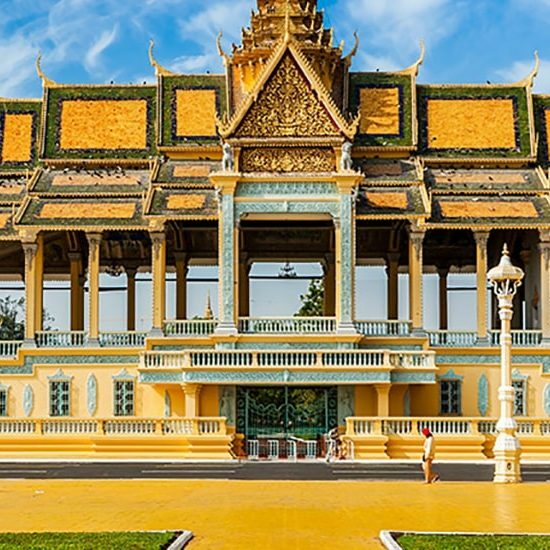 By the time the French departed in 1953, they had left many important landmarks, including the Royal Palace, the National Museum, Psar Thmei (Central Market) and many impressive government ministries. The city grew fast in the post-independence peacetime years of Norodom Sihanouk’s rule: by the time he was overthrown in 1970, the population of Phnom Penh was approximately 500,000. As the Vietnam War spread into Cambodian territory, the city’s population swelled with refugees and reached nearly three million in early 1975. The Khmer Rouge took the city on 17 April 1975, and as part of its radical revolution immediately forced the entire population into the countryside. Whole families were split up on those first fateful days of ‘liberation’. During the time of Democratic Kampuchea, many tens of thousands of former Phnom Penhois – including the vast majority of the capital’s educated residents – were killed. The population of Phnom Penh during the Khmer Rouge regime was never more than about 50,000, a figure made up of senior party members, factory workers and trusted military leaders. Repopulation of the city began when the Vietnamese arrived in 1979, although at first it was strictly controlled by the new government. During much of the 1980s, cows were more common than cars on the streets of the capital. The 1990s were boom years for some: along with the arrival of the UN Transitional Authority in Cambodia (Untac) came US$2 billion (much of it in salaries for expats). Phnom Penh has really begun to change in the last two decades, with roads being repaired, sewage pipes laid, parks inaugurated and riverbanks reclaimed. Business is booming in many parts of the city, with skyscrapers under development, investors rubbing their hands with the sort of glee once reserved for Bangkok or Hanoi, and swanky new restaurants opening. 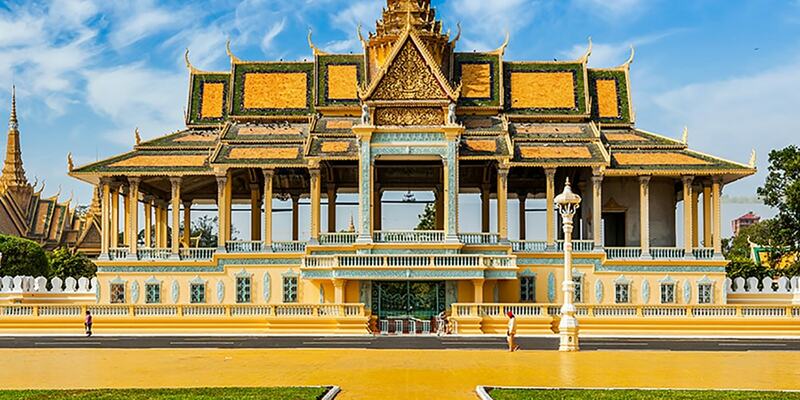 Phnom Penh is back, and bigger changes are set to come. Anyone who spends a night or two on the town in Phnom Penh will soon be familiar with young girls and boys hovering around popular bars and restaurants to sell decorative flowers. The kids are incredibly sweet and most people succumb to their charms and buy a flower or two. All these late nights for young children might not be so bad if they were benefiting from their hard-earned cash, but usually they’re not. Look down the road and there will be a driver of a moto (motorcycle taxi) with an ice bucket full of these flowers waiting to ferry the children to another popular spot. Yet again, the charms of children are exploited for the benefit of adults who should know better. Think twice before buying, as the child is unlikely to reap the reward. Cambodia has a critical shortage of blood as there’s a local stigma against donating blood and a high rate of thalassaemia. If you want to help, donate at the National Blood Transfusion Centre. It’s perfectly safe and you get a T-shirt, although only 18 to 60 year olds can donate. Start early to observe the aerobics sessions on the riverfront, then grab breakfast before venturing into the Royal Palace. Next is the National Museum of Cambodia and the world’s most wondrous collection of Khmer sculpture. After lunch at Friends restaurant, check out the funky architecture of Psar Thmei, but save the serious shopping for the Russian Market. Celebrate your shopping coups with a riverside happy-hour drink at FCC, and then a night out on the town. Start day two with a Khmer Architecture Tours walking tour of the centre, or just wander around Wat Phnom, where Khmers pray for luck. Have lunch on the riverside, then visit the sobering Tuol Sleng museumbefore continuing on to the Killing Fields of Choeung Ek. It is a grim afternoon, but essential for understanding just how far Cambodia has come in the intervening years. 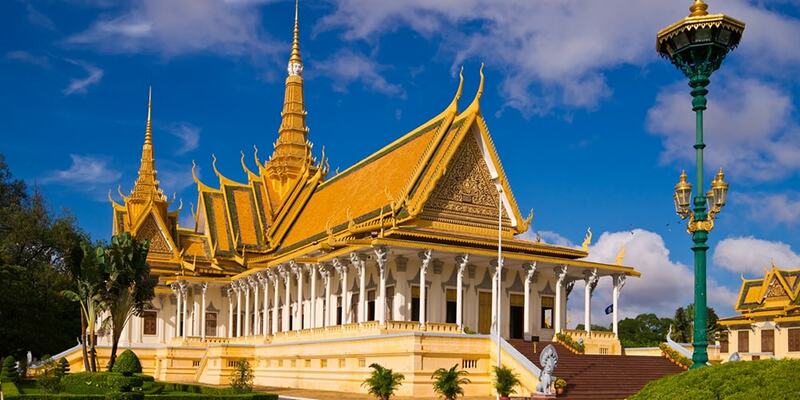 Wind up your weekend with a sunset cruise on the Mekong River, offering a beautiful view over the Royal Palace. Jan–Feb The holiday crush is over and pleasant northeasterly breezes massage the riverfront. Sep–Oct Heavy rains provide relief from searing sun; many hotels offer steep discounts. Oct–Nov The water festival Bon Om Tuk is one giant street party on the banks of the river. It’s possible to hire bicycles at some of the guesthouses around town for about US$1 to US$2 a day, but take a look at the chaotic traffic conditions before venturing forth. Once you get used to the anarchy, it can be a fun way to get around. There are also shops that rent out road bicycles and mountain bikes. Phnom Penh has a few local bus lines running north to south and east to west, but they are not widely used by visitors, as the routes are very limited. Most useful is Bus No 3 which links the city centre with the airport. 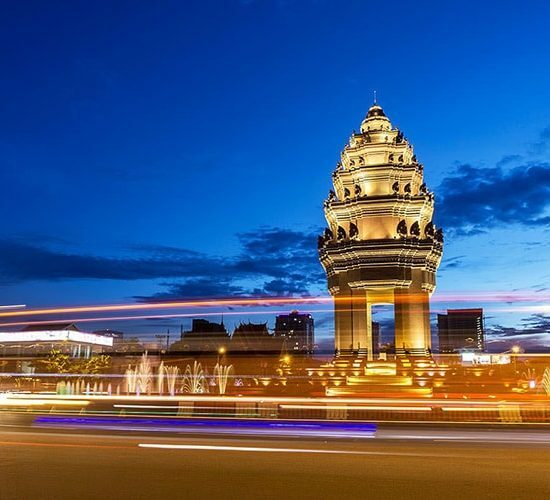 There is a popular sightseeing bus, the Phnom Penh Hop On Hop Off, which connects leading sights around the city. Exploring Phnom Penh and the surrounding areas on a motorbike is a very liberating experience if you are used to chaotic traffic conditions. There are numerous motorbike-hire places around town. A 100cc Honda costs US$4 to US$7 per day and 250cc dirt bikes run from US$12 to US$30 per day. You’ll have to leave your passport – a driver’s licence or other form of ID isn’t enough. Remember you usually get what you pay for when choosing a bike. A Cambodia licence isn’t a bad idea if you’ll be doing extensive riding. Motorbike rental shops can get you one for about US$40. Otherwise you technically need an international licence to drive in Cambodia (although it is not unusual for police to take small bribes from drivers who don’t have one). If you want to purchase insurance (available at motorbike rental shops for about US$22 per month), you’ll need an international or Cambodian licence. Remember to lock your bike, as motorbike theft is common. 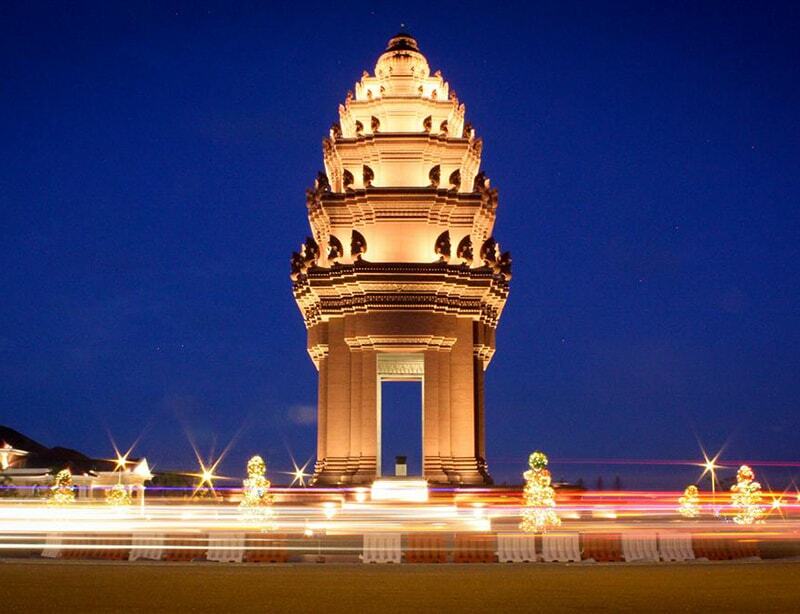 Car hire is available through travel agencies, guesthouses and hotels in Phnom Penh. Everything from cars (from US$30 per) to 4WDs (from US$60) are available for travelling around the city, but prices rise fast once you venture beyond. Lucky! Lucky! Motorbikes are US$4 to US$7 per day, less for multiple days. Trail bikes from US$12. Two Wheels Only Has well-maintained bikes available to rent (motorbike/trail bike per day US$7/25). Vannak Bikes Rental Has high-performance trail bikes up to 600cc for US$15 to US$30 per day, and smaller motorbikes for US$5 to US$7. Travelling by cyclo (bicycle rickshaw) is a more relaxing way to see the sights in the centre of town, although they don’t work well for long distances. For a day of sightseeing, expect to pay around US$10 – find one on your own or negotiate a tour through the Cyclo Centre. For short, one-way jaunts costs are similar to moto (motorcycle taxi) fares. You won’t see many cyclos on the road late at night. In areas frequented by foreigners, motodups (moto drivers) generally speak English and sometimes a little French. Elsewhere around town it can be difficult to find anyone who understands where you want to go. Most short trips are about 2000r to 3000r, although if you want to get from one end of the city to the other, you have to pay US$1 or more. There are fewer moto drivers than in the past, as many have upgraded to remork-motos (tuk tuks). Cambodians never negotiate when taking rides (they just pay what they think is fair), but foreigners should always work out the price in advance, especially with motodups (moto drivers) who hang out in touristy areas like the riverside or outside luxury hotels. Likewise, night owls taking a moto (motorcycle taxi) home from popular drinking holes should definitely negotiate to avoid an expensive surprise. The remaining moto drivers who wait outside the popular guesthouses and hotels have reasonable English and are able to act as guides for a daily rate of about US$10 and up, depending on the destinations. Better known as tuk tuks, remork-motos are motorbikes with carriages and are the main way of getting around Phnom Penh for tourists. Average fares are about double those of motos (motorcycle taxis): US$2 for short rides around the centre, US$3 and up for longer trips. Remorkdrivers will try to charge more for multiple passengers but don’t let them – generally pay per ride not per person (although groups of four or more should pay an extra US$1 or so). Newer, partly electric-powered Indian-style auto-rickshaws are also now found on the streets of Phnom Penh. In theory, these are metered and exceptional value, but in practice tourists will need to negotiate similar fares to a remork. At 3000r per kilometre, taxis are cheap, but don’t expect to flag one down on the street. Call Global Meter Taxi, Choice Taxi or Taxi Vanthafor a pick-up. There are now several dedicated Phnom Penh taxi apps, although they are still very much in their infancy. Try Exnet or iTsumo. Uber has also recently launched in Cambodia. Many international air services operate to/from Phnom Penh International Airport. 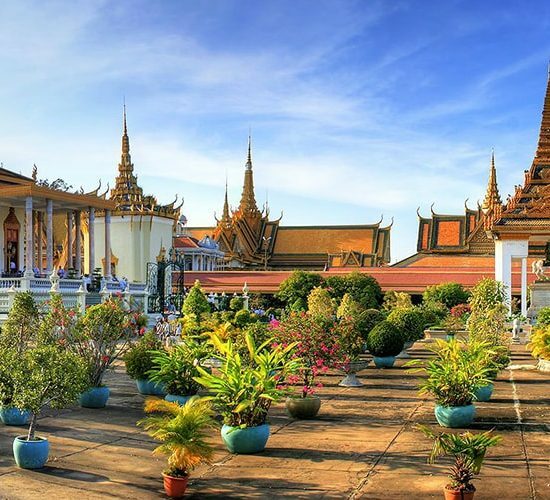 Domestically, there are now several airlines connecting Phnom Penh and Siem Reap. Cambodia Angkor Air flies four to six times daily to Siem Reap (from US$35 to US$110 one way, 30 minutes), while Bassaka Air, JC Airlines (www.jcairline.com) and Cambodia Bayon Airlines have at least one flight a day, from US$20 to US$75 one way. Healthy competition has really driven down prices recently, so it pays to book ahead for special promotions. Phnom Penh International Airport is 7km west of central Phnom Penh, via Russian Confederation Blvd. Facilities include free wi-fi, a host of internationally recognisable cafes and restaurants and some decent handicraft outlets for last-minute purchases. There are also ATMs for US dollars withdrawals on arrival or departure. When arriving by air at Phnom Penh International Airport, there is an official booth outside the airport arrivals area to arrange taxis to the centre for US$12; a remork-moto (tuk tuk) costs a flat US$9. You can get a remork for US$5 to US$7 and a moto (motorcycle taxi) for about US$3 if you exit the airport and arrange one on the street. The cheapest option to the city is the Bus No 3 (1500r) which has a stop right outside the airport and runs to the Night Market and riverfront. It can be slow with 20 or more stops along the way, but then so can taxis with all the traffic. Heading to the airport from central Phnom Penh, a taxi/remork/motowill cost about US$10/6/3. The journey usually takes between 30 minutes and one hour depending on the traffic, but can take up to 90 minutes during rush hour. Fast boats up the Tonlé Sap to Siem Reap and down the Mekong to Chau Doc in Vietnam operate from the tourist-boat dock at the eastern end of St 104. There are no public boat services up the Mekong to Kompong Cham and Kratie. The fast boats to Siem Reap (US$35, five to six hours) aren’t as popular as they used to be. When it costs from as little as US$6 for an air-conditioned bus or US$35 to be bundled on the roof of a boat, it’s not hard to see why. It is better to save your boat experience for elsewhere in Cambodia. Several companies have daily services departing at 7am and usually take it in turns to make the run. The first stretch of the journey along the river is scenic, but once the boat hits the lake, the fun is over: it’s a vast inland sea with not a village in sight. The boats to Siem Reap run from roughly August through March (water levels are too low at other times), but do not necessarily depart daily, so plan ahead. The most scenic way to end your travels in Cambodia is to sail the Mekong to Kaam Samnor (about 100km south-southeast of Phnom Penh), cross the border to Vinh Xuong in Vietnam, and proceed to Chau Doc overland or on the Tonlé Bassac River via a small channel. Chau Doc has onward land and river connections to points in the Mekong Delta and elsewhere in Vietnam. Various companies do trips all the way through to Chau Doc using a single boat or some combination of bus and boat; prices vary according to speed and level of service. 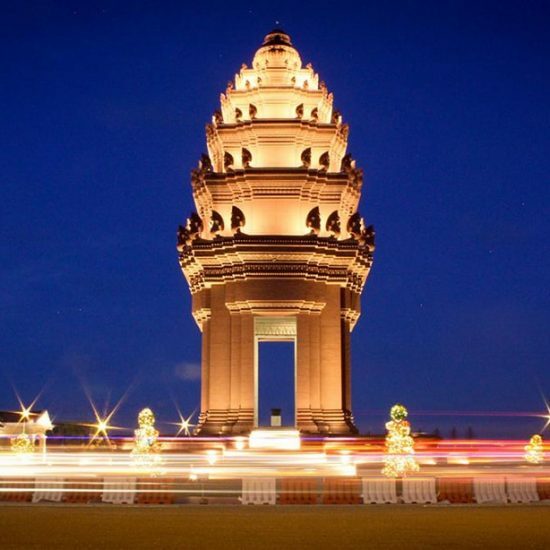 Capitol Tour departs Phnom Penh at 7.30am and involves a bus transfer; the trip is about six to seven hours. Hang Chau departs from the tourist-boat dock at 12.30pm and the entire journey is by boat; the more upmarket and slightly faster Blue Cruiser departs at 1.30pm; Victoria Chau Doc Hotel also has a boat making several runs a week between Phnom Penh and its Victoria Chau Doc Hotel. These companies take about four hours, including a slow border check, and use a single boat to Chau Doc. Backpacker guesthouses and tour companies offer cheaper bus/boat combo trips. All boats depart from Phnom Penh’s tourist-boat dock. Some nationalities require a Vietnam visa in advance and some do not require a visa. Check with the Vietnamese Embassy in Phnom Penh to see if you need a visa or not, as visas are not available on arrival. 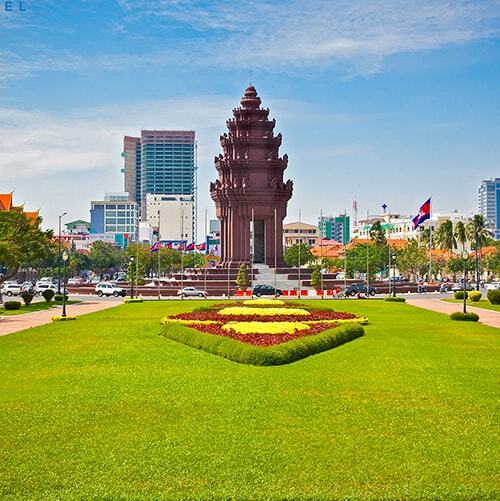 If arriving from Vietnam, Cambodia visas are available on arrival. All major towns in Cambodia are accessible by air-conditioned bus from Phnom Penh. Most buses leave from company offices, which are generally clustered around Psar Thmei or located near the corner of St 106 and Sisowath Quay. Buying tickets in advance is a good idea for peace of mind, although it’s not always necessary. Not all buses are created equal, or priced the same. Buses run by Capitol Tour and Phnom Penh Sorya are usually among the cheapest, while Giant Ibis and Mekong Express buses are better and pricier. Most of the long-distance buses drop off and pick up in major towns along the way, such as Kompong Thom en route to Siem Reap, Pursat on the way to Battambang, or Kompong Cham en route to Kratie. However, full fare is usually charged anyway. Express minivans are generally faster than buses on most routes, but some travellers prefer the size and space of a large bus. Speedy express minivans (minibuses) with 12 to 14 seats serve popular destinations such as Siem Reap, Sihanoukville and Sen Monorom. These cut travel times significantly, but they tend to be cramped and often travel at very high speeds, so are not for the faint of heart. Several of the big bus companies also run vans, most famously Mekong Express. It’s a good idea to book express vans in advance. Share taxis and local minibuses leave Phnom Penh for destinations all over the country. Taxis to Kampot, Kep and Takeo leave from Psar Dang Kor, while packed local minibuses and taxis for most other places leave from the northwest corner of Psar Thmei. Vehicles for the Vietnam border leave from Chbah Ampeau taxi park, on the eastern side of Monivong Bridge in the south of town. You may have to wait awhile (possibly until the next day if you arrive in the afternoon) before your vehicle fills up, or pay for the vacant seats yourself. Phnom Penh’s train station is located at the western end of St 106 and St 108, in a grand old colonial-era building. Passenger train services returned to Cambodia in April 2016 with the inauguration of weekend trains from Phnom Penh to Kampot and Sihanoukville. Royal Railwaysruns trains in either direction, departing Phnom Penh or Sihanoukville at 7am on Saturday and Sunday. Phnom Penh to Sihanoukville is US$7 and takes about nine hours. Phnom Penh to Kampot is US$6 and takes about five hours. There are also evening services on Friday/Saturday/Sunday from Phnom Penh and a morning service from Sihanoukville to Phnom Penh on Monday at 7am. Getting to the border The original Bavet/Moc Bai land crossing between Vietnam and Cambodia has seen steady traffic for more than two decades. The easiest way to get to Ho Chi Minh City (HCMC; Saigon) is to catch an international bus (US$8 to US$13, seven hours) from Phnom Penh. There are several companies making this trip. At the border Long lines entering either country are not uncommon, but otherwise it’s straightforward provided you purchase a Vietnamese visa in advance (should you require one). Moving on If you are not on the international bus, it’s not hard to find onward transport to HCMC or elsewhere.